strawberry lemon sugar cookies — Mel bakes things. Thursday was the first day where the weather even remotely felt spring-ish. That, coupled with my curiosity over a recently acquired bag of unsweetened freeze-dried strawberries, inspired and end-of-week baking session. 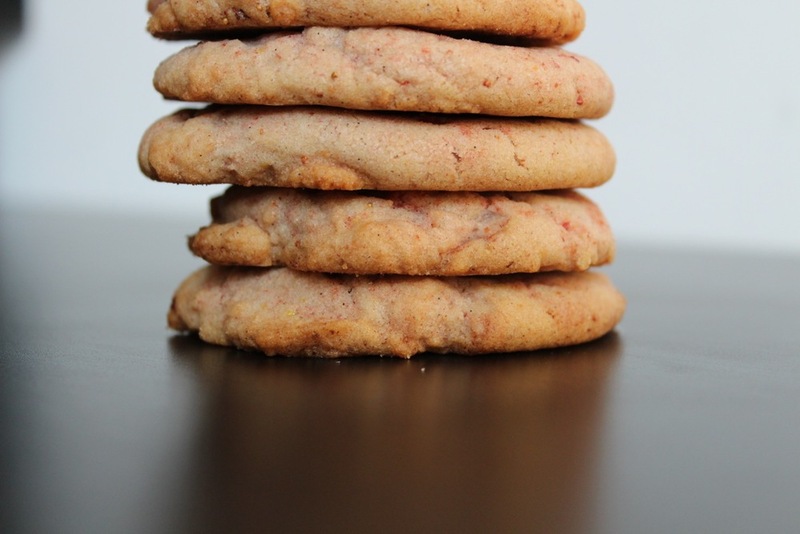 Because clearly, spring + strawberries = cookies. No? You didn't come to that conclusion? Oh well. Spring and summer are obviously perfect for berries and citrus, and I thought I'd try to incorporate those light flavors into a sugar cookie. Let's face it, sugar cookies can be pretty boring if you don't find a way to spice them up once in a while. And while sprinkles and icing are fun sometimes....it was a weeknight. Ain't nobody got time for that. Freeze-dried berries are pretty easy to find these days...Whole Foods and Trader Joe's both have them. To make the strawberry powder, just blitz the freeze-dried strawberries in your food processor until they're ground to a mostly-fine powder. Using a mixer with a paddle attachment, beat the butter on medium speed for about 1 minute. Add the canola oil. Mix for 1 minute. Add the granulated sugar, powdered sugar, zest, egg and vanilla, mixing on medium speed until each ingredient is incorporated. With the mixer on low speed, add the flour, baking soda and salt all at once. You shouldn't need to mix for long before the ingredients are incorporated. Scrape down the sides/bottom of the bowl and mix for another few seconds to make sure everything is distributed evenly. With a wooden spoon, fold strawberry powder into the dough. Refrigerate the dough for 45 min to 1 hour. Dollop dough onto cookie sheet -- one heaping tablespoon for each cookie. Press the dough with palm to 1/4-inch thickness. Bake for 9 to 14 minutes (depending on your oven and the size of your cookies). Let the cookies cool on the baking sheet for at least 10 minutes before transferring to racks to cool completely.